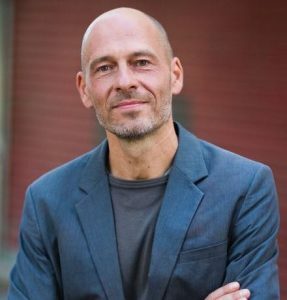 Geographer Christophe Guilluy (pictured) had prophesied the potential of this uprising in 2014. Guilluy demonstrated that the demographics of most major French cities comprise the wealthy, banking, industrial-capitalist centers surrounded by the ghettoized and marginalized suburbs that are home to an estimated 60 percent of the urban population. For those scraping a living together in the suburbs, driving to and parking in the city center for work could cost as much as 250 Euros ($284) per month. The impact of an increase in the cost of fuel would hit these people the hardest. Historian and author Diana Johnstone, based in France, best explained the origin of the Yellow Vest as the symbol of this organic, grassroots movement. The yellow vest is something that every French citizen must have in their car in case of a road accident — the vest must be worn to prevent being unseen and run over by other vehicles. Wearing the yellow vest during protests signifies that French citizens do not accept being invisible to, and railroaded by, their government. Acte XII came one week after the shocking targeting of prominent Gilet Jaune spokesman Jerome Rodrigues in Paris on January 26, 2019. Rodrigues had been filming live during the march when the arrival of the Black Bloc contingent caused him to call for the GJs to withdraw and avoid the inevitable violence. The Black Bloc element will be examined in a later section of this article. On film, we can see the police factions advance, ignore the Black Bloc (or “Casseurs” in French), and begin targeting the retreating and peaceful GJs. Rodrigues is first targeted by a GLIF4 grenade that detonates close to him and is then hit in the eye by an LBD40 “flashball” bullet. After his hospitalization, Rodrigues informed his thousands of followers that there is little chance of saving his eye. As he is a plumber by trade, this senseless injury will have a potentially catastrophic effect on Rodrigues’ ability to provide for his family. Rodrigues is only one of 19 GJs who have lost an eye to the “sub-lethal” LBD40 bullet launcher that is being liberally used by security forces during GJ protests across France. The LBD40 is the evolution of the notorious “flashball bullet,” 10 times the velocity of a paintball. The modern LBD40 launcher is a very accurate instrument with a “red-dot” laser pointer sight that ensures pinpoint targeting of civilians. A collage showing French security forces taking aim at Yellow Vest protesters with the LBD40 launcher. Recently, French human-rights organizations, the UN Human Rights Commissioner, and members of the French medical fraternity have unequivocally cautioned against the use of the LBD40 in crowd-control situations. While it is classified as a “sub-lethal” weapon, when used in violation of police regulations, at close range and in unstable crowd environments, it is lethal and capable of terrible damage to a human body — particularly the face, which appears to be a favorite target of the national police in France. OPP calls for a ban on LBDs and GLIF4s. It also demands that the BAC police officers are no longer involved in demonstrations and asks for a moratorium on the presence of private security and intervention companies at the GJ marches. The photo below has been circulating on social media; it shows what appear to be civilians carrying French national police weapons and working alongside official police factions during a GJ march. Previous investigations have revealed that the GLIF4 grenade, or “grenade de desencerclement,” has also been condemned by an internal French police laboratory inquiry and recommendations have been submitted to the Interior Ministry for the banning of their use in crowd-control operations. The GLIF4 contains 25g of TNT, emits 165 decibels, and may contain CS or tear gas in powder form or 10g rubber pellets released upon detonation. These grenades have been responsible for the amputation of hands, hematomas, and the formation of necrotic tissue among the GJ demonstrators. Despite all the evidence of the traumatic effects of these weapons upon civilians, the French Council of State ruled that the LBD40 was a necessary instrument of “self-defence” for the forces of “law and order.” This ruling was announced two days before Acte XII. Acte XII thus went ahead in the knowledge that there was a high risk of further injuries and targeting of civilians by the forces of “law and order” with weapons that are clearly “lethal” when misused. The French Interior Minister, Christophe Castaner, also ruled that the GLIF4 grenade would continue to be used until stocks were exhausted, without specifying the number of grenades still in stock. The only conclusion that can be drawn from this blatant denial of responsibility for the mutilation of French citizens by the state-militarized police forces is that the state is effectively enabling and endorsing the police savagery being witnessed nationwide. Castaner further denied any use of the controversial LBD40 bullet in Place de la Bastille, where Rodrigues was targeted. Unfortunately for Castaner, the enquiry conducted by the Inspection Generale de la Police Nationale (IGPN), the police ombudsman in France, found that the police had used the LBD40 launcher at the moment of Rodrigues’ wounding. In the report, the policeman admits to using the LBD40 but denies targeting Rodrigues, claiming that they hit another demonstrator in the stomach. Castaner continues to refute the deliberate targeting of a prominent and popular member of the GJ movement, despite a plethora of video evidence filmed by other GJ demonstrators who were surrounding Rodrigues at the time. After a short speech the wounded Gilets Jaunes will lead the march. During the march there will be a pause to demand the prohibition of weapons such as Flashball LBD40 and the GLIF4 grenades. …Paris and all cities of France will collectively pay their respects to the wounded, the Gilet Jaunes victims, injured in their thousands and dozens mutilated for life. I traveled to Paris to participate in the march and to witness events for myself. I arrived as the GJs were just beginning to gather before setting off on the 5km march through the Paris streets — final destination, Place de la République. The atmosphere was buoyant and defiant but definitely good humored and peaceful. There was a strong sense of solidarity and what struck me most was the representation of a wide range of French society. All classes, all backgrounds, all ethnicities unified in rejection of the erosion of their civil liberties and threat to their constitutional right to protest the perceived transformation of the French state into a repressive plutocracy. As protesters were milling around, enjoying live music and the colorful, imaginative costumes, the Black Bloc or “Casseurs” (looters) arrived. Around 10 Casseurs ran towards the GJs, dressed head to foot in black and with their faces covered. They pushed a woman to the ground and ran over her. The atmosphere changed immediately: the GJs started to chant “Dégages” or “get out,” and I could hear shouts from the organizers calling for calm and no violence. The Casseurs headed to the nearby restaurant, some brandishing wooden clubs, and were clearly threatening to smash the windows. Almost immediately, a number of GJs encircled the Casseurs and forced them to retreat without causing any damage. There was a degree of ensuing confusion, during which I could hear protesters condemning the Casseurs and calling for them to stop profiting from the GJ marches to carry out their violent acts of destruction and demolition of public property. An independent journalist, Laurent Daure, who accompanied me on the march, stated that it was always difficult to identify the Casseurs and to know whether they belonged to Antifa, an alleged anti-fascist movement with suspected funding from notorious philanthrocapitalist, George Soros; or to far-right factions that have also piggy-backed the GJ marches to promote their agendas; or whether they were agents provocateurs despatched by the French state to discredit the GJ movement, guilt by association. After rousing speeches from Rodrigues and other previously injured GJ protestors who attended the march, we set off amidst the cacophony of brass bands, drums and chanting of the GJ songs and slogans that have become the mantra of these marches — “Macron assassin” and “Macron demission/resign” being two of the most popular. As we progressed along the predetermined route, I was impressed by the number of people who came out on their balconies as we passed and were waving yellow balloons and French flags in solidarity. The rear of the march was flanked by motorcyclists wearing yellow vests who intermittently revved their engines to add to the orchestra of protest. Different sections of the march were differentiated by the banners they were carrying. One thing I was acutely aware of was that the blue flashing lights of police cars could be seen a few hundred meters behind us as we moved through the streets. The police did not accompany the march as we are accustomed to seeing in the U.K. When the Casseurs re-appeared alongside the march at various moments, there was no effort made by the police to arrest them or prevent the damage they caused to shop and bank windows along the route. In fact, it was very much left to the GJs to manage the Casseurs, which put them at risk and will lead to further accusations from some residents, business owners and government ministers that the GJs are the cause of the damage. The march had a brief pause in Place de la Bastille, the area where Rodrigues had been shot the weekend before. The GJs peeled off into the surrounding restaurants for sandwiches and refreshments. There was an atmosphere of conviviality among the restaurant staff and their yellow vested clientele. Again, I remarked that the police vans and cars kept a distance, lights flashing. There was no effort by the police to mingle with the marchers despite it being a good-natured event. As the GJs set off again on the last leg of the march, towards Place de la Republique, I noticed that the vans of police had moved closer and the heavily armored police officers were on the pavement. They were remote and tense, not prepared to converse with marchers or bystanders. Just before the Place de la Republique, the victims of previous police violence were diverted down a side street as news had reached the march that tear gas was already being used in Place de la Republique less than 200 meters away. Most marchers told me this was following the pattern of previous marches, so the priority was to protect the injured from any further harm. Marchers had joined hands in a circle around the injured as a symbol of protection and solidarity and they opened the circle to allow the safe exit of their comrades. Victims of police violence are taken to safety down a side street just before Place de la Republique., Acte XII, Feb 2, 2019. Photo | Vanessa Beeley. As we approached Place de la Republique, the tear gas was drifting towards us and started to sting our eyes and the back of our throats. The scene in the square itself was one of demonstrators trying to relax after the march. People were standing in groups talking, buying coffee and tea from the stalls, or simply walking around. A man walked past me carrying a yellow rose. This was not the hotbed of “pestes brunes,” the “fascist plague,” as described by Gérald Darmanin, Macron’s budget minister. As I advanced, I filmed the protesters. I could see nothing that would provoke the police to fire the tear gas to force people to disperse. It was clear that this was the end of the march and that people would start to drift back home after a few moments of reflection and discussion. As I got closer to the center of the square, the boom of tear gas launchers became more persistent and people started to react and to panic. It became clear very quickly that this was a deliberate attempt to incite the crowd and to drive them toward the arterial roads and side streets which, by now, were blocked by the security forces. It is now proven that the French state is using a more potent gas against its own people. State militia or police forces are using CM3 gas in preference to CM6 gas in some cities. CM3 is six times more intense than CM6 and can cause skin lesions and damage to the eye cornea along with increased nausea; burns to the face; and, during prolonged exposure (which is the current police tactic), damage can be permanent and risk of chronic conditions increased. Police block exit routes from Place de la Republique, turning civilians back towards the square which was enveloped in tear gas, Acte XII, Feb 2, 2019. Photo | Vanessa Beeley. I saw one tourist, pulling his wheeled suitcase behind him, ask the police if he could pass. The officer refused. The line of police started to advance. I spoke to one burly officer who had taken position next to me. I asked him how he could do this to his own people. He replied that “this is as bad for us as it is for you,” and insisted that we move down to the next exit point which he claimed was open. People were refuting that information; they knew it was also closed. Suddenly another officer grabbed me by the arm and started to push me towards the square. The police line was advancing rapidly, sweeping civilians towards certain danger and risk of injury. The following video shows the violence of one the police charges into the crowd; a journalist is flung to the ground. On February 5, French MPs voted to pass the repressive Loi anti-Casseurs (the anti-looting law). Reaction on social media from the GJs and their supporters has been swift to condemn what they judge to be another attack on their constitutional rights and their liberty to protest injustice. The law has the full support of Interior Minister Castaner and his Macroniste acolytes. A minority in Parliament consider the new law to be a threat to civil liberties. Protesters who have been banned will be listed as wanted people. Those covering their faces during a protest, including wearing a gas mask, risk one year in prison and being fined 15,000 Euros ( $17,000 ). What is Macron afraid of? bubble has burst on the sword of dissent. Macron’s foreign policy has been nothing more than an extension of the resource-hungry globalist plundering of target, resource-rich nations such as Syria — and now Venezuela is in Macron’s neoliberal crosshairs. Even while France burns, Macron is shoring up the distorted narratives that support the U.S. military and economic adventurism in Venezuela. The Gilets Jaunes have exposed Macron for what he really is: an instrument of power on the global stage who will not be allowed to deviate from his machiavellian road map. Under Macron, France is rapidly being plunged into plutocracy and totalitarianism, and the French people are pushing back. If being a yellow vest means wanting fewer parliamentarians and work being paid better, I am a yellow vest, too! 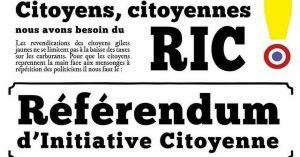 One GJ demand has pierced the heart of the globalist movement: the referendum or direct democracy. The demand is for a designated substantial number of signatories to determine the right to call a referendum on specific issues. As author Diana Johnstone points out, “the right to a CIR [Citizens Initiated Referendum] exists in Switzerland, Italy and California.” This proposal threatens to wrest power away from those who have a monopoly over it and who make decisions for their populations that serve their own interests not those of the “little people.” It will send shivers down the spine of neoliberalism and globalism. Johnstone cited the case of Etienne Chouard, a teacher who has been working on the concept of direct democracy for decades. 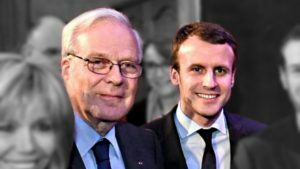 The GJ movement has kicked Macron’s hornets’ nest, and what we are witnessing is the turning of the jackboot of power and tyranny against its own people — “the little people” who are of no consequence to the giants among the ruling elite, the wealthy, the privileged who profit from the spilling of blood at home and abroad, where their military adventurism has resulted in the deaths of millions of “little people” in Iraq, Yemen, Syria, Libya, Central Africa and is now threatening Venezuela. “We will not kneel, we will not fear reprisals, we will keep protesting until the end,” said one GJ to me on Saturday as the police tore into the crowd, scything people to the ground and trampling them underfoot. Vanessa Beeley is an independent journalist, peace activist, photographer and associate editor at 21st Century Wire. Vanessa was a finalist for one of the most prestigious journalism awards – the 2017 Martha Gellhorn Prize for Journalism – whose winners have included the likes of Robert Parry in 2017, Patrick Cockburn, Robert Fisk, Nick Davies and the Bureau for Investigative Journalism team. You can support Vanessa’s journalism through her Patreon Page. 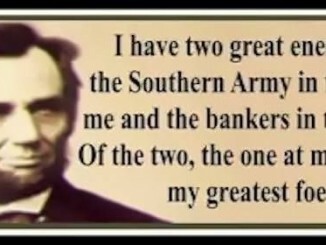 THE BANKSTERS AND THE B.A.R. WHO IS RUNNING AMERICA?